This Hexapod has been specifically designed for entry, rescue & lift.ing into confined spaces having larger openings. KARAM Hexapod is made from lightweight Aluminium and can be easily installed by a single user. Comes with two aluminium anchorage pulleys (AP012SS) at the head of both the Tripods for guiding the cable of rescue winch. Has two auxiliary eye bolts in both the Tripods, each as an attachment points. Hexapod is provided with inbuilt fixture for attaching our winch PN 801, PN 817A, PN 818, PN 818SR, PN 818(C), PN 801(132ft. )(can be supplied without this fixture on special request. Hexapod can also be used with Retrieval SRL’S PCGS 30ft R, PCGS 60ft R & PCGS 100ft R with the help of their universal mounting bracket. 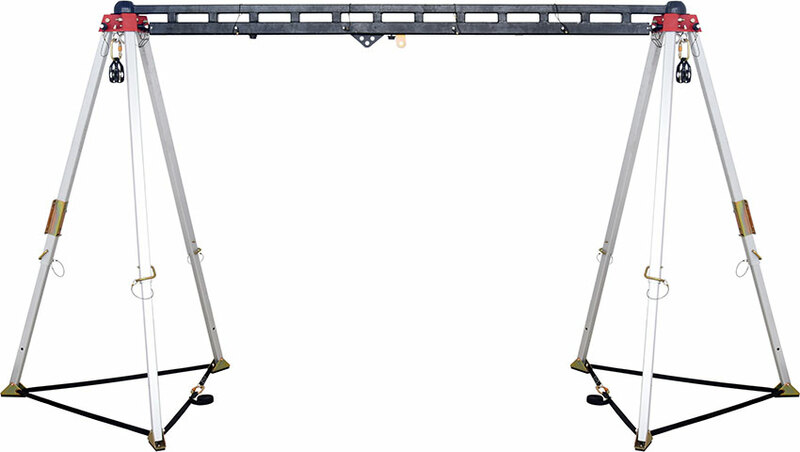 Fully Adjustable Telescopic Legs, Adjustable Height From 3.8 ft. to 7.05 ft.
Can be used on a very large area of max. span of 7.5 ft.